Best Online Schools with Music Business Degrees in the U.S.
Music is a major part of daily life for just about every American, so it’s no surprise that for a second year in a row the U.S. music industry has produced double-digit growth, with revenues accounting for more than $17 billion of the $51.5 billion generated globally. By 2021, music industry revenue in the U.S. will total over $22.6 billion. As music consumption continues to grow, the demand for talented business professionals in music industry management will continue to grow as well. While having a passion for music and business is a great start to a career in this and other music industry careers, to compete in today’s competitive global music market, most aspiring music business professionals will need a degree from an accredited school. Some of the best schools with music business degrees are also located in or near major music capitals such as Los Angeles, New York, Nashville, and Miami. While location is important, students also place a high value on flexibility and convenience. Fortunately, many of the best schools with music business degrees also offer online or hybrid programs, or at the very least, courses or other components online. We’ve identified below seven universities that meet all of the criteria of a “Best” school for aspiring music business professionals. The schools are listed in alphabetical order, beginning with Full Sail University. Full Sail University is an arts, entertainment, media, and technology school that serves approximately 15,000 students across 210 acres of campus space, including 110+ studios and labs. Known for its immersive, fast-paced approach to learning, Full Sail University is listed as one of the Top 25 Music Schools by The Hollywood Reporter and the school has won three of the prestigious TEC awards. This award-winning school is also regionally accredited by the Accrediting Commission of Career Schools and Colleges (ACCSC) and is licensed by the Commission for Independent Education (CIE), Florida Department of Education. Full Sail University began in 1979 as a recording studio in Dayton, Ohio named Full Sail Productions. Today the school offers 93 programs leading to associate's, bachelor's, and master's degrees. Programs are offered on-campus and online via the Full Sail Online platform. Among these programs is a BS in Music Business that takes just 29 months to complete online. Per the school, students in the program “will develop skills that extend beyond the recording industry into the realms of film, television, video games, and sports.” Taught by professionals in the field, courses cover everything from marketing and publishing to artist management. Learn more about Full Sail's programs. Project and Portfolio courses combine “hands-on learning experiences with summative and formative portfolio assessments,” says the school. These courses are taken in addition to an internship, which can be pursued after the student has successfully completed 50% of the required credit hours for the BS program. Per the school, graduates of Full Sail’s BS in Music Business are employed in fields listed under the broad “Agents and Business Managers of Artists, Performers, and Athletes,” as categorized by the Bureau of Labor Statistics (BLS). Sample job titles include Agent, Artist Agent, Artist Manager, Artist Representative, Athlete Marketing Agent, Booking Agent, Talent Agent, Talent Buyer, and Talent Manager. Coles College of Business at Kennesaw State University (KSU) offers both online BBA and MBA degrees. Now, all KSU students can add the Joel A. Katz Music and Entertainment Business Program (MEBUS) as a minor concentration to their major course of study. The 24-credit hour program, which also made the 2018 Billboard list, is designed to “provide the foundation of practical experiences, on-the-job training, and exploration of career opportunities in the music and entertainment industry,” says the school. Because the program is an immersive, hands-on, addition to the major, students must complete an externship where they work onsite at least six hours a week. The school says that job placement is the primary goal of the MEBUS program. With its close proximity to Atlanta (a reemerging music hub), students will have plenty of opportunities to develop professional relationships in the music and entertainment industry. In fact, students have interned with companies such as Coca-Cola Studios, the Grammys, Sixthman, Red Light Management, Live Nation, Moxie and many others. The MEBUS Program is largely based around events as well, so students will be required to participate in all aspects of these events. One such event is the annual study abroad trip to London, which includes an all-day visit with international executives at Sony Entertainment. Students can expect to complete the program within two years. There are no additional fees for adding the MEBUS certificate to the degree and a certificate is awarded. Graduates of the program have been hired at the organizations listed earlier as well Joel A. Katz’s law firm, Greenberg Traurig. Mr. Katz is founding Chairman of the firm's Global Entertainment and Media Practice and the Founding Shareholder of the Atlanta Office. Kennesaw State University is accredited by the Southern Association of Colleges and Schools Commission on Colleges (SACSCOC) to award baccalaureate, masters, specialist, and doctorate degrees. All degree programs in the Coles College of Business are AACSB-accredited. Middle Tennessee State University (MTSU) is located just 34 miles from Nashville—the capital of country music. This is one of the many reasons those looking to break into the music industry choose MTSU. The school also offers an endless number of music programs—including both undergraduate and graduate degrees in Music Business. Offered through the College of Media and Entertainment, Department of Recording Industry, the undergraduate Music Industry BS is one of the schools leading undergraduate concentrations. Music Business is one of three unique concentrations offered to students pursuing an MBA in the Jennings A. Jones College of Business. MTSU Music leadership includes heavy hitters such as Beverly Keel, Chair of the Department of Recording Industry and former senior vice president of Media and Artist Relations for Universal Music Group Nashville, where she developed extensive media campaigns for icons such as Lionel Richie, country singers such as Scotty McCreery, bands such as Sugarland, and many others. 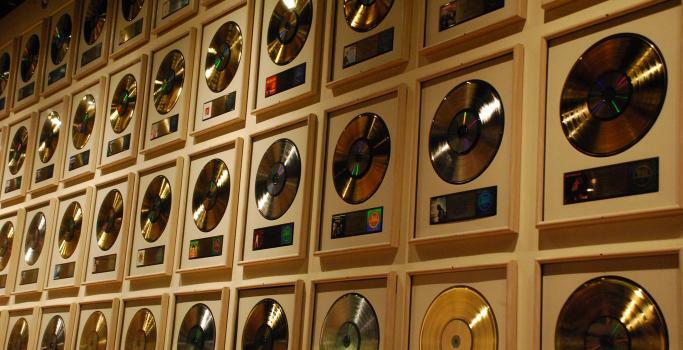 Head of the Commercial Songwriting Concentration Rick Carnes has earned 40 platinum albums with songs recorded by Alabama, Conway Twitty, Garth Brooks, Pam Tillis, and Reba McEntire. Carnes is also President of the Songwriters Guild of America and a leading advocate for songwriters and copyright protection. Middle Tennessee State University is accredited by the Southern Association of Colleges and Schools Commission on Colleges (SACSCOC) to award baccalaureate, masters, and doctorate degrees. Jennings A. Jones College of Business is AACSB-accredited. The Master of Music in Music Business and Entertainment Industries (MBEI) is a 30-credit hour program that the school says is “designed to meet the specialized demands of the reinvented music industry.” It prepares “qualified music business students for these emerging opportunities with many opportunities to gain hands-on experience” during the program. MBEI graduates work for major record labels, independent record companies, music publishing companies and talent agencies in various business positions. Both certificate options can be completed in as few as 16 weeks. There is no minimum GPA to be admitted to the certificate programs and no test scores are required. Transferable certificate credits may be used to satisfy requirements for the Frost MBEI or the MA in Arts Presenting and Live Entertainment Management. The MA is available online. Miami Business School at University of Miami also offers a customizable Online MBA Program that allows students to tailor their degree to fit their interests and aspirations. Those with an interest in the music business can add any graduate certificate offered through Frost School of Music. Students can also declare an MBA specialization in addition a certificate or opt for the 42-credit hour Professional MBA + a certificate. Specializations require 47 to 51 credits. For the Online MBA, a one-week residency and on-campus orientation and campus tour are offered, but not required. University of Miami is accredited by the Southern Association of Colleges and Schools Commission on Colleges (SACSCOC) to award baccalaureate, masters, specialist, and doctorate degrees. The Frost School of Music has been an accredited institutional member of the National Association of Schools of Music since 1939 and the School of Business is AACSB-accredited. Students will complete a “Seminar in Entrepreneurship” and an “Entertainment Entrepreneurship,” as part of the business core. During the final year of the program, students will complete “The Garage Experience,” which is the Academy capstone experience that allows students to develop innovative projects leading to operational prototypes and viable enterprises. Students are mentored by faculty and industry experts. While this the BS in Arts, Technology and the Business of Innovation is not available 100% online, some components of the program are online and for graduates of the BS program, a new online MS in Integrated Design, Business and Technology is available. Although the program graduated its first class in May 2018, three seniors in the program co-founded a startup company, Mira, to produce an augmented-reality headset dubbed Prism and gained $1.5 million in venture-capital investment. USC has been accredited by the Western Association of Schools and Colleges (WASC) since March 6, 1949. The school’s music programs have additional accreditation by the National Association of Schools of Music (NASM). The business programs at USC are accredited by the Association to Advance Collegiate Schools of Business (AACSB). The School of Music at West Virginia University (WVU) offers an MA and a Graduate Certificate in Music Industry. The MA consists of three multidisciplinary modules including Music Industry Foundations, Music Commerce, Management and Operations, and Music Production Methods and Technology. Sample courses include Development of Music Technology, Foundations of Music Publishing Industry, Foundations of Recording Industry, and Music Industry Regulations. Sample courses include Advanced Music Publishing, Advanced Recording Industry, Artist Representation, International Music Industry, Music in Multi-Media, and Music Organization and Commerce. This module consists of two courses at three credits each for six credits total. Students will explore the fundamental technical aspects of music recording and live music production processes. Students will be provided with “the crucial technical understanding and knowledge necessary for appropriate interdisciplinary creative and commercial decision-making and operations.” Courses include Live Music Production and Recording Production. Admission to the MA in Music Industry is selective and competitive. Applicants must have a bachelor’s degree from an accredited university and a GPA of 3.0 or higher. The GRE is required, as well as a CV, and a 500 word essay describing the student’s professional preferences, goals and aspirations. Students must achieve 153 on the verbal, and 144 on the quantitative GRE sections. Courses cover music industry regulations, music rights administration and enforcement mechanisms, production planning, budgeting, regulations management and compliance procedures, and commercial production standards and processes. Students will also learn about mainstream music publishing industry models, structures and organization, and music catalog acquisition, administration and advancement methods and processes. West Virginia University is accredited by the Higher Learning Commission (HLC). The University has been an institutional member of the National Association of Schools of Music since 1947 and its business programs are AACSB-accredited. Cotsakos College of Business at William Paterson University (CCOB WPU) offers a Part-Time Flex MBA that allows students to accelerate their studies with summer courses or choose a blend of flexible online, hybrid, and weekend courses along with traditional evening courses. The program has seven specialized concentrations, including Music and Entertainment Management. The school’s close proximity to New York makes it an ideal choice for students looking to be near some of the top recording studios in the country and other music businesses. Students will complete an internship/capstone experience designed specifically for the supervised practical application of previously studied theory in a group setting. The experience takes place under the supervision of a faculty sponsor. Study abroad opportunities are available as well as job placement. Currently 90% of CCOB MBA graduates are in management and leadership positions six months after graduation. Graduates of the Music and Entertainment Management MBA go on to work in a variety of careers in the music industry including Artist Manager, Booking Agent, Entrepreneur, Music Distributor, Music Marketing Manager, Music Supervisor, PR Manager, and Tour Manager, to name a few. William Paterson University has been continuously accredited by the Middle States Commission on Higher Education (MSCHE), the region’s accrediting body for colleges and universities, since its first accreditation in 1958. Cotsakos College of Business is AACSB-accredited. Caulfield, Keith. “U.S. Music Consumption Up 12.5% in 2017, R&B/Hip-Hop Is Year's Most Popular Genre.” Billboard, Billboard-Hollywood Reporter Media Group, a division of Eldridge Industries, 03 Jan. 2018. Web. 10 Oct. 2018. Duffy, Thom. “Bonnaroo U? Billboard's 2018 Top Music Business Schools.” Billboard, Billboard-Hollywood Reporter Media Group, a division of Eldridge Industries, 29 Jun. 2018. Web. 10 Oct. 2018. “Music Business Careers.” CareersInMusic.com, 2018. “USC Iovine and Young Academy Launches New Online Master of Science.” Academy News, USC Iovine and Young Academy, 2017. Web. 10 Oct. 2018. “U.S. Music - Statistics & Facts.” Statista, The Statistics Portal, Statista, 2017. Web. 10 Oct. 2018. Top Online Schools with Music Business Degrees in the U.S.
Best Online Schools with Entertainment Business Degrees in the U.S.
Top Online Schools with Entertainment Business Degrees in the U.S.
Best Online Schools with Music Production Degrees in the U.S.
Best Online Schools with Audio Production Degrees in the U.S.
Top Online Schools with Audio Production Degrees in the U.S.